As a teenager in 1940s Calgary, Arthur Mudry dreamed of being an aeroplane engineer. But a chance discovery of a book on gothic cathedrals caught his imagination, and changed his career trajectory to architecture. Perhaps this is why his work embodies a sense of both the sacred and the ethereal. In the architectural cathedral that is West Vancouver’s coastal forest, as one approaches his 1965 Beaton residence from its steep cliffside entry that descends towards the Pacific waters of Garrow Bay, the house appears to hover over the landscape. There’s a feeling that the magnificent home, at one with its site, could take flight at any moment. In fact, feats of architectural levitation aside, the house is in danger of disappearing. 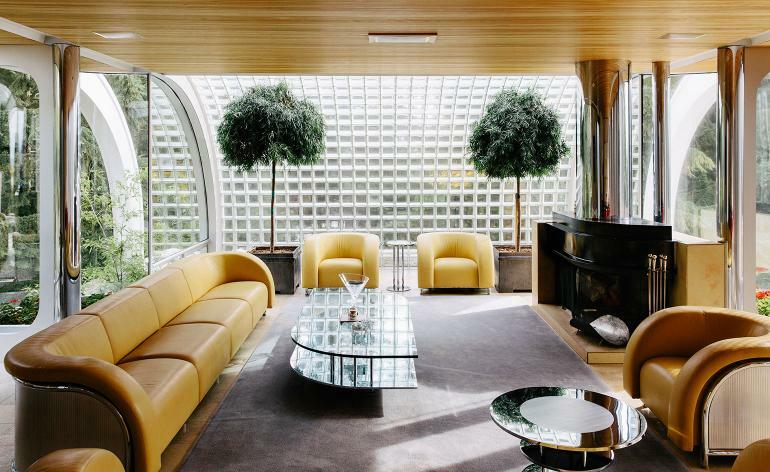 West Vancouver, Canada’s treasure trove of midcentury modernism, where Arthur Erickson, Ron Thom, Barry Downs, Fred Hollingsworth and other architects built some of their most sublime residences, has a rapidly rising real estate value. Erickson’s Graham House fell victim to lax preservation laws in 2007. Now other midcentury gems, such as the BC Binning house, are on deathwatch in a district where developers often triumph over heritage advocates. So it is a rare privilege to spend time with Mudry revisiting one of his most beloved houses, one that, after the demise of its original owners last year, is listed at C$7.9m (£4.6m) – ‘lot value’, says a local developer whose company, like many others, now builds ‘monster homes’ on West Vancouver’s large lots, often ten times the size of the relatively modest midcentury footprints like that of the Beaton residence. Rooted in bedrock, yet reaching for the sky, bound by sea and forest, the house is a device for viewing nature. A kind of rustic West Coast pavilion – a cousin perhaps to Arthur Erickson’s 1958 Filberg House – it is part Shinto temple, part paean to Pacific forest. A residential shrine, its architecture draws in the centrifugal force of the elements. It would seem no coincidence that Mudry’s subsequent project was a rough cedar-clad Baptist church in West Vancouver, shrouded by a grove of old-growth firs. ‘Nature is sacrosanct,’ proclaims the now 85-year-old architect, ‘so I tried to tie the form of living into the crevices of the rocks and the spirit of the trees.’ Rather than blasting the bedrock, Mudry designed a meandering entranceway via a winding staircase that respects the contours of the site. As one enters the house, he says, ‘it’s like stepping into nature’. And indeed, once past the heavy timber Japanese-style door and welcoming lanterns, the westward view of ocean provides an instant embrace. Arriving upstairs in the master bedroom, sheltered to the east by a Japanese-style lattice and etched-glass window that create a double screening effect, the whole bay seems to envelope the space. Standing at the main entrance downstairs, the tip of the ceiling is visible through the south-facing glazing. The eye follows its line to reveal a cedar post supporting the umbrella-like vaulted ceiling, with no cross beams to distract from the arc of the protective forest-like canopy.